Model: There are electrical connections between the cars and the locomotive, and the power pickup and the headlights / marker lights change between the locomotive and the cab control car, depending on the direction of travel. The headlights and marker lights for the train change over with the direction of travel, will work in conventional operation, and can be controlled digitally. The locomotive has an mfx digital decoder and the new controlled compact design Softdrive Sine high efficiency propulsion. 4 axles powered. 2 traction tires. The locomotive has separately applied metal grab irons. It also has interior details for the engineer's cabs. The locomotive has separately applied roof walks. The triple headlights (maintenance-free warm white LEDs) and dual red marker lights (maintenance-free LEDs) change over with the direction of travel, will work in conventional operation and can be controlled digitally. 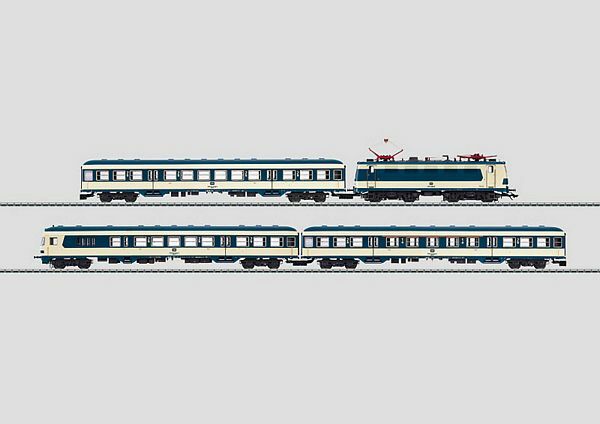 Electric locomotive operating sounds with the fire cracker sound, lights at the ends of the locomotive, and acceleration and braking delay can be controlled with the 6021 Control Unit and with Marklin Systems. The whistle sound and the sound of brakes squealing can be controlled with Marklin Systems. The locomotive has detailed buffer beams. It also has NEM coupler pockets and a close coupler mechanism. The cab control car has triple white headlights (maintenance-free warm white LEDs) and dual red marker lights (maintenance-free LEDs) that change over with the direction of travel. It also has a lighted destination sign that can be controlled digitally with the headlights / marker lights. Total length over the buffers 102.6 cm / 40-3/8. Real shuttle train function as a model with pickup shoe changeover. Prototypical changes to the locomotive body: no rain gutters, Klatte design vents. One-time series. The Karlsruhe Train - The Experimental S-Bahn. The use of the much praised class ET 420 was not convincing in the Rhine-Ruhr area. There were longer routes to cover and passengers did not at all like the lack of toilets. The DB reacted to the many complaints by placing a locomotive-hauled S-Bahn train into service. In the mid-Seventies the Karlsruhe maintenance facility developed prototypes for a shuttle train from three Silberlingen / Silver Coins commuter cars. The cars were equipped with swinging-sliding doors with electromagnetic door locks and a permanent entrance that limited its use in the route network since a station platform of at least 76 cm / 30 was a requirement. The interior of the cars was designed to be more manageable and the baggage area was done away with in the cab control car in favor of more seats. The cars were painted in the color scheme for that time of ocean blue / beige, but in reverse, which clearly differentiated the train from the rest of the DB rolling stock. In addition, several standard Silberlinge / Silver Coins cars were also adapted by the Karlsruhe maintenance facility and were used as reserve cars. The Hagen 141 248-5 was selected as motive power, and it was given an unusual, asymmetrical paint scheme to go with the train. It made the train look like a complete unit. In the rough and ready everyday existence of S-Bahn trains the Karlsruhe train was not successful basically because the locomotive did not have enough acceleration. The cars were then put back into normal service rather quickly and the German Federal Railroad used the experience with the Karlsruhe train to develop the type x cars, which still form the backbone of the commuter service in the Ruhr area. These cars run in trains of 3-5 cars, usually pulled by the class 111 or class 143. This model can be found in a DC version in the Trix H0 assortment under item no. 21337.